John Kane-Berman is uniquely qualified to look back over the enormous political and social changes that have taken place in his lifetime in this fractious country. In his career as student leader, Rhodes Scholar, newspaperman, independent columnist, commentator, and Chief Executive of the South African Institute of Race Relations for thirty years, Kane-Berman has been at the coal face of political change in South Africa. The breadth and depth of ideas and events covered in Between Two Fires are striking: the disintegration of apart- heid, the chaos of the ‘people’s war’ and its contribution to the broader societal breakdown we see today, the liberal slideaway, the rise of an authoritarian ANC with its racial ideology and revolutionary goals, to mention only a few. It is a book full of fizzing ideas. 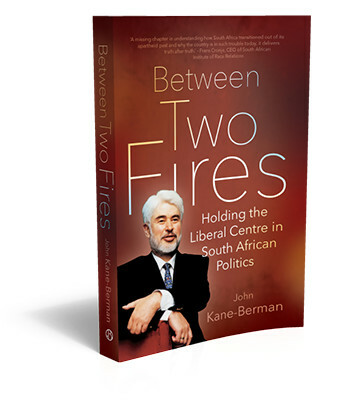 Kane-Berman’s willingness to confront received wisdom is thoroughly refreshing, and he is forthright about the threats to freedom, democracy, and growth in contemporary South Africa, many of which he identified even before the ANC came to power. He is equally forthright in putting forward liberal ideas to halt the country’s downward slide. Writing, debate, and reasoned argument are Kane-Berman’s stock in trade, and his clarity of vision and personal insight have created a memoir of rare candour and absorbing interest. You can buy the book from Exclusive Books, Takealot or as an e-book on Amazon.